Being the middle of winter, what a great place, with plenty of places available, but not the only ones here. Great location with a short ride to downtown Branson! Gravel lots, not perfectly level, but a nice place! Many sites are not level. I saw many Class A coaches with the front wheels off the ground. Unfortunately, you can't reserve a specific site (a level site) ahead of time and you have to take what you get. Good location. 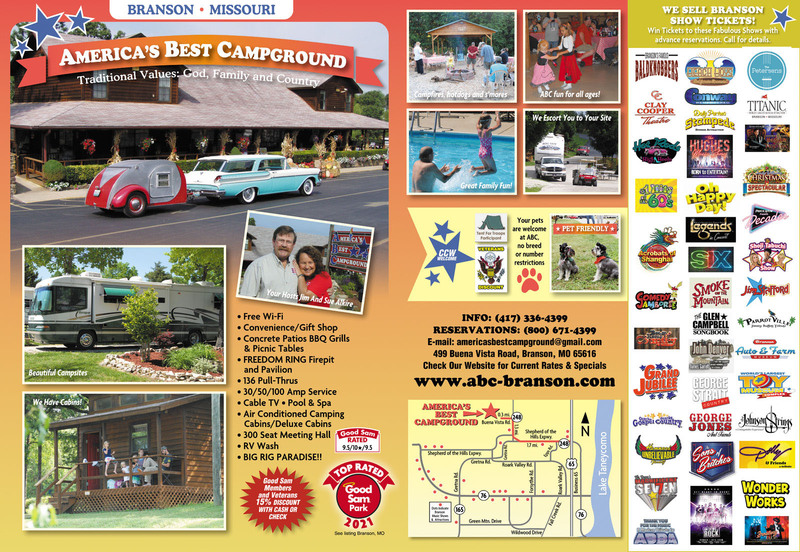 This is a great campground close to all that Branson has. It is a little bit out of town, but still close to what you want (Branson is not that big). The staff was super friendly and accommodating Each day we stayed here, they gave away show tickets. We won. There were no strings attached, just free tickets to show we actually wanted to see. This is not a resort campground. Branson in the attraction, Other than the pool and playground I did not see a lot for the kids, The sites are almost all pull through. Many lots have a mature tree or two. The next time we come to Branson, ABC will be where we stay. I found this park on the Good Sam's Site. I am glad I stayed here. I felt safe, the park was clean, the people at ABC were friendly and helpful. Liked so much, I book another stay while I was there. We wanted to see Branson and decided on this campground. We got the listing out of the Good Sam book. The add was good. Price was fair. After looking at the reviews we decided to stay here. I'm glad we did. It was quiet, the staff was real friendly. Got a great spot under a tree. The pool was small but ok. TV reception was iffy. Would we stay here again if passing through, yes. We took our family for a business trip and stayed at ABC. 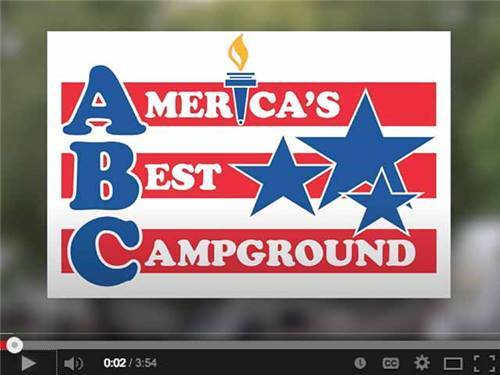 Absolutely wonderful staff, campground and amenities. With it being "off-season" we were expecting to be somewhat left-alone, but we were greeted warmly and welcoming. Will certainly be back! I'm a novice RV Camper and wanted a place where the sites were level and preferably pull-through. ABC was fantastic! Up on the north side of the Branson area on the quiet back roads but near shopping and restaurants. Only about 3 miles into the 76 Highway Entertainment strip. It was clean, well-maintained, and excellent customer service. I will definitely go back there! Great, a lot of campers but verry quiet. Excellent customer service. 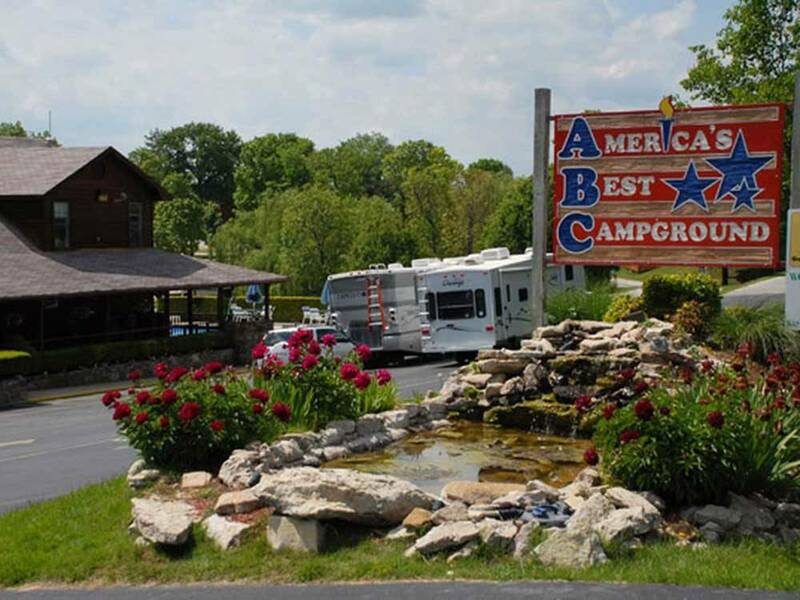 Great campground, close to but not in all the hustle of Branson, The people were friendly and helpful, the grounds were great and we had an overall wonderful stay. From Jct of US 65 & SR-248, W 1.7 mi on SR-248 (move to right turning lane), continue N 1.3 mi on SR-248 to Buena Vista Rd, W 0.3 mi (L) Note: Use these directions, do not use GPS.